There is a common saying — leaders need to attract and retain top talent. Clearly, this is a great practice. However, when the labor market is saturated and the bid for talent is hyper-competitive, attracting and retaining talent becomes a strategic imperative. Gartner’s sales talent benchmarks indicate that compensation is the most important attribute in attracting sales employees, followed by work-life balance and stability. When sales leaders are attracting new talent, they will have to pay the compensation premium or lower the standards to attract more junior talent. While figuring out which option is best, sales leaders should also highlight the internal programs that help sellers maintain a work-life balance and promote the consistency of the organization (if it exists). One obvious mechanism to limit the pains and cost of attracting sale talent is to retain your sellers, especially your top talent. To help retain sellers, sales leaders should connect sellers to their employee value proposition (EVP). Gartner describes the EVP as how an employee perceives value by working in an organization across five attributes: Opportunity, People, Organization, Work and Rewards. The ultimate benefits are in seller engagement. 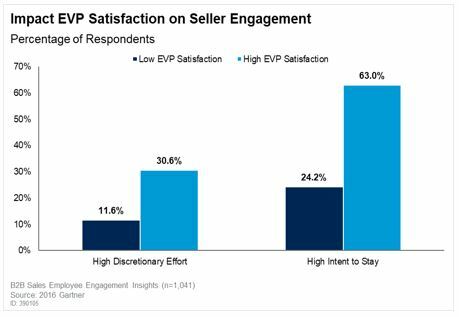 When a seller is highly satisfied with their EVP, their responses to High Discretionary Effort and High Intent to Stay improve by nearly 3x. That’s a significant improvement that can easily reduce risks and expenses. Sales leaders must make seller attraction and retention a priority to avoid sales execution issues that put goals at risk. Fortunately, sales leaders have many levers within their control to improve both attraction and retention.